We’re what professionalism sounds like. The perfect soundtrack to the best day of your life, spun with your wedding or event in mind. The DJs of Complete Weddings + Events St. Louis will keep you and your guests dancing till the reception ends. Matt will go out of his way to personalize your big event and provide special touches to it that you will love! Mr Jackson was amazing!! He knows what he is doing! He interacted with the crowd and made jokes, kept everyone laughing. We all loved when he got out and showed us how to do the thriller dance. He really cares about what he does and makes sure we are having a good time! I recommended 3 couples that are getting married next about complete weddings and Mr Jackson! Our DJ was absolutely amazing. Matthew did a fabulous job, he played great music, interacted and was so fun!! We got SO MANY compliments on the music and our DJ! He was an absolute gem, I can't recommend him enough. We were on the fence about spending money on a DJ, he was worth every penny and more! Recently, I did a show at the Promise Christian Academy. My fondest memory was how well the night went. The dance floor was packed the entire night. This is the first of many shows, where the crowd left the dance floor packed. I also made a new friend that night as well. I am able to use my top notch (A+) personality to amaze audiences and create memorable nights for brides and grooms everywhere. My unique voice and the way I personalize my shows. I enjoy the getting the party started with a fun activity like our Snowball dance or a Group Photo. This is when the party really begins. I really enjoy the song, “Where have you been,” by Rihanna. I became a DJ because I really enjoy entertaining crowds across the world. Being a DJ, I have gotten the chance to dazzle, amaze and pump up many crowds. As an entertainer myself, this profession is something that makes me feel right at home in my field of work. Some of my favorite TV/Netflix shows are Luke Cage, Married with Children and Boy meets World. Who doesn’t love Luke Cage, Al Bundie or Corey/Tapanga Matthews lol. I just wanted to reach out and let you know that Prince Moses did an amazing job at my best friends wedding on Sept 29th. I am a wedding photographer in Memphis that covers around 30 weddings a year, and may I say that Mr. Moses is right up there with the best of them that I have seen. He was very professional and when asked to stay a little later to keep the party going, he was happy to oblige making the wedding just that much more enjoyable. Thank you for providing such an awesome DJ and please let him know how much we appreciated his service. Moses was amazing! He was very attentive during the whole process- before, during and after. What I appreciated most- is he was willing to do exactly what we needed- and he has great customer service! I heard multiple comments all night that this was definitely “the best DJ ever” Next time I host an event and need a DJ I’m definitely requesting Moses! 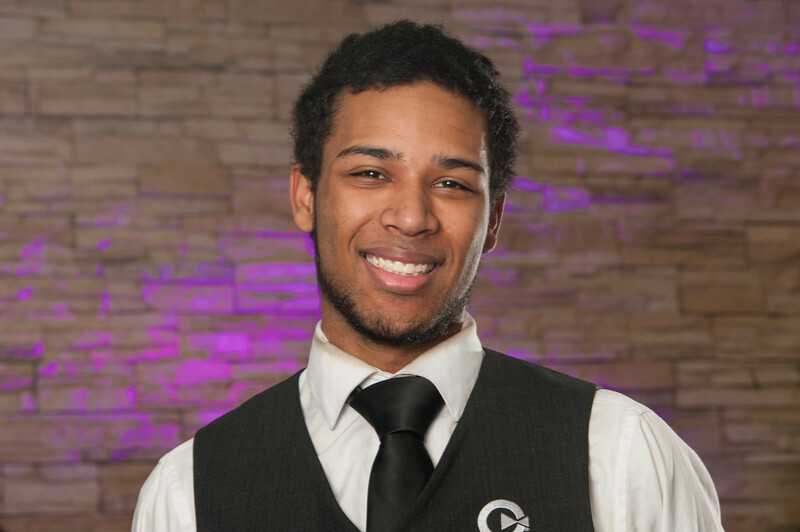 Marcus is your guy if you’re looking for a hip, fun and super friendly DJ! I am outgoing and the friendliest person ever! I enjoy what I do and love to have a great time with every event I go to!! My favorite memory is when I hosted a birthday party a dance battle broke out in the middle of the floor. Both participants were busting out all the stops! At the end of the night they had such a great time that they invited me to go with them to their after party; I felt just like a part of the family! My favorite thing about being a DJ is I get to meet new people and connect with them on a whole new level. My proudest moment is when I got my first request because it made me feel like I was doing something right that people were actually enjoying having me. I go out and and interact with the crowds. I dance with them and party all night with them until they drop. That includes breaking out those bad moves I have but people enjoying me just coming out and getting involved. My favorite part of the night is doing the intros, watching people come out with amazing energy getting the crowds hype for the evening. Then of course it’s the dancing portion of the night where everything gets crazy and buck wild!! Everyone is just left loose and cutting up on the dance floor. My favorite party song is the shoot dance because no matter where you go or what age range everyone tries to do that dance and to witnessing the older crowds try to do the dance is awesome. Plus is gives me a chance to really show them how the king does (this guy). I became a DJ because I love music and interacting with different people. The one thing in this world that can bring people together is music. It brings excitement and fun to anything. The second I’m booked with you you are guaranteed a night to remember!!! Marcus was amazing!! He kept the party going! Everyone loved that he came out and danced with us!! I will for sure use you guys again for my next event!! Thank you soo much for making my party that much greater!!! 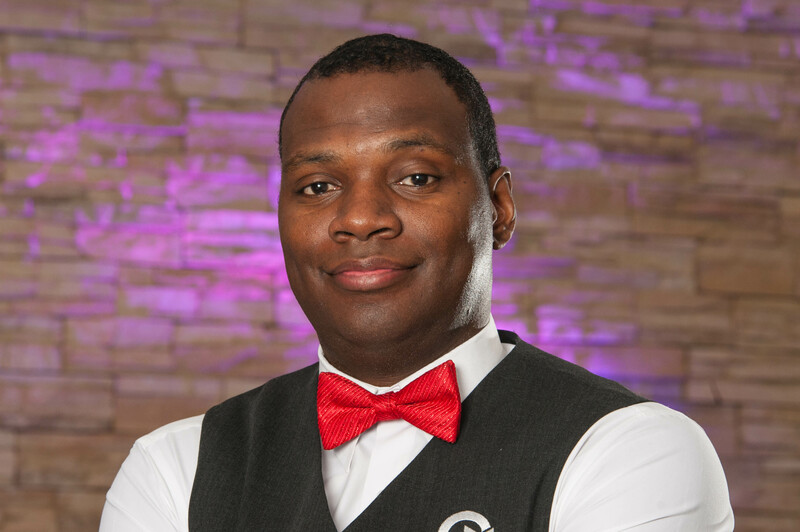 Nathan is a Complete veteran that has won multiple awards, is one of our trainers and does great with those wanting a very lively and interactive approach from their DJ. My personality can range from easy going to super detailed to help go with the flow of your big day. Every bride plans differently and experiences their wedding day differently and I try the best I can to recognize what is needed (and of course what they want) and morph that into your wedding. What’s your favorite memory from an event? I had a bride who was a HUGE Guardians of the Galaxy fan and asked that I sprinkle in the movie’s iconic music whenever possible throughout the night. From their entrance song being Hooked on a Feeling by Blue Swede to their dance floor opener being Come and Get Your Love by Redbone I had an absolute blast being creative and customizing the night for her because I’m such a big Marvel Studios nerd! What’s your favorite thing about being a DJ? My absolute favorite part of being a DJ is when I recognize we have a vocal crowd that likes to sing along to the music. Sweet Caroline, I Want it That Way, (and my personal guilty pleasure) Stacy’s Mom can all get that “Call and Response” back and forth going with the audience. Getting people to just scream at the top of their lungs to their favorite songs is just such a thrill! What makes you unique or stand out as a DJ? I’m constantly recognized as The Wooden Bow Tie Guy at my events. I own three handcrafted wooden bow ties that I always wear out at the weddings at work at and people have recognized me from bridal shows and corporate events just because of the bow tie and how well I rocked the event they were at! What’s your favorite party song right now? My feet point outwards, like a duck, so most of my friends refer to me as Duckie. Wow! Nathan was our DJ and I can't say enough about how awesome he was! First off the whole COMPLETE system is so organized I filled out a form online with questions of how I wanted my wedding to go and such and Nathan called me to go over everything and make sure we were on the same page and man he was spot on at my wedding! I couldn't have even imagined it going as perfect as it did! He was so outgoing and engaging; I couldn't even get off the dance floor because I loved every song he played! And we had so many people on the dance floor all night, it was never empty and at the end of the night the whole dance floor called for an encore last song and I have never seen that before! Everyone had a blast and said it was the best wedding they have ever been to and I know that had a lot to do with complete and NATHAN!! Oh and best of all they were so affordable! Bonus! Everything was perfect!! Nathan was amazing to work with! His introductions were awesome and he kept the party going all night long!! We had many compliments about him from our guests!! There were people on the dance floor all night! I would recommend Nathan to anyone! Our monograms and uplighting looked great as well! Overall, complete was amazing to work with! They exceeded my expectations and made my wedding reception a lot of fun for everyone! Rachel is loved by everyone that she interacts with! She takes the tangle out of your big night by making sure everything runs smoothly and will make sure you and your guests are having a blast! She has a 100% customer satisfaction rating!! At one wedding the bride and her brides maids all broke out into the worm during a dance circle, it was iconic! My favorite part about being a DJ is just making people feel special and loved, by playing their perfect songs and being on top of all the details. To be honest, it’s probably that I’m one of a few female DJ’s so I have a different perspective when it comes to working weddings and having a sense of what would make the bride happy. The best part of the night is getting the dance party started with the wedding party and playing a song that lights everybody up. What is better than dancing and having fun at work while making people’s big day? Rachel was great and made our wedding a really special event. She was on top of everything all night, was great with our guests, and handled the MC portion like a pro. Played all the songs we wanted to at the right times and kept the dance floor going all night. All of our guests loved the music and had a great time. Our DJ, Rachel, was AWESOME!! She was very attentive to our wishes and our ceremony was amazing because of it. During the reception, she continuously checked to see if things were going ok and to make sure we were ready to do the next thing. Although we were to end at 10, we paid for another hour because we were having so much fun. Thank you so much!!! I would describe my “DJ personality as someone that is relatable and can make you feel like we could have easily known each other forever. I’m easy to get to know and very laid back. My favorite thing about being a DJ is getting to know the bride, groom, and all of their guests and then catering the party to their needs and watching them have a blast. It’s a great feeling. I think what makes me unique or stand out is my ability to build the entire day, whether that’s a wedding or any other event, around the clients personality and have them enjoy everything about that day. And not just certain parts of the day. My favorite part of the night….open dance. No doubt about it. Getting everyone involved is really fun. My favorite party song right now might be Finesse by Bruno Mars ft. Cardi B.
I became a DJ because I love music and working with all of the equipment. What I didn’t know I’d enjoy so much until I started DJing is the awesome reactions of the guests throughout the night to the music and the special events that take place. A fun fact about me is that aside from DJing I produce music and love to play piano. Ryan was amazing! Our guests loved every moment and he definitely made for an easy, smooth night. Choose Ryan for your next night of celebration! The Bride wanted to sing her way down the aisle as a surprise for the groom. I set it up so she could sing while her pastor played guitar through my sound system. It went off without a hitch and was one of the most beautiful wedding moments I have ever seen. I love to see a packed dance floor because I know I have hit on the right music. I make sure to tailor every event to the couple, making sure that their event matches their unique tastes while still appealing to the entire guest list. However, what sets me apart from other wedding DJs is my years of experience as an EDM DJ. For those who love EDM, I can provide a true club experience with seamless mixes of their favorite tracks from the 90’s through today. I love the moment at the end of the night when we all gather on the dance floor to wish the happy couple a wonderful life together. The one that makes that particular crowd run to the dance floor! Every crowd is different. I just love a song that gets everyone excited and takes the party to the next level! I have always been a musician of some type and a friend turned me on to DJing as a teenager. I have been doing it off and on ever since. My parents made up my name by combining three names whose meanings they liked. They also chickened out at the last minute and made Taven my middle name on my birth certificate. I liked the fact that you contacted us prior to the wedding to find out what type of music we were interested in and exactly what we wanted to do about first dance, cutting cake, etc. Our DJ was Taven. He was WONDERFUL!! He went around to all of the tables during dinner and asked everyone for suggestions as to what they wanted to hear. He also got everyone going and up on the dance floor. Thank you so much for making our wedding a memorable experience. Taven was an amazing DJ! He had people dancing the entire time and interacted very well with the crowd! Made our night absolutely perfect! 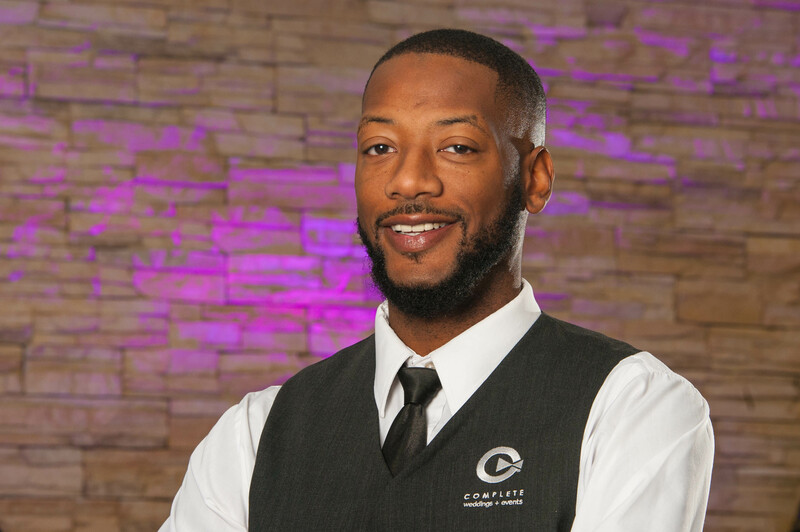 Veteran DJ Thurman Rhodes can handle any wedding or party. 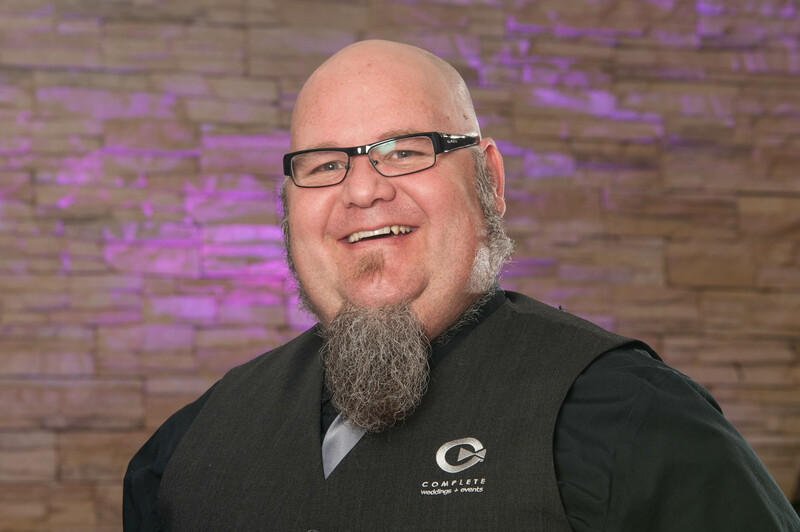 He is a master at music, mixing and injecting just the right amount of energy to your special event! The DJ was attentive to every detail. He hooked up MY extra projector and video screen FOR ME!! We were short staffed when it came time to eat and the man helped SERVE my guests. He even helped set up the salad bar. Above and Beyond is all I can say. He played great music including all of my requests. I just have no words to express my gratitude to Thurman. He was outstanding. Your DJ was professional and worked with our venue. Your music variety is great! We really appreciated that we could customize what we wanted and request specific songs. Your personalization system allowed us to have the wedding reception we really wanted. Creative If you are looking for a new way to do something, Zach can probably think it up. An extremely experienced DJ and charismatic speaker, ceremonial events seem that much more special when Zach is the one emceeing them. I started in 1995 with another DJ company to make some extra money doing something I love, playing music. As a musician and a lover of great times, I’ve always enjoyed helping other people have fun. I’ve been with Complete Music since spring of 2005, and it’s by far the best DJ company I’ve ever worked with because I have something going on almost every single weekend. We’re always busy, and that means I’m always helping to make someone’s event memorable! “I Gotta Feeling” by The Black Eyed Peas has become this generation’s “Celebration”, so I used it a lot to kick off the open dancing portion of the evening. “Shout” by Otis Day & the Knights, “Don’t Stop Believin'” by Journey, and “It’s Tricky” by Run-D.M.C. are also great party boosters. At a recent wedding, a member of the brides family asked for Mambo # 5, which I didn’t have with me. She had the song on cassette, but since we only have CD players and I Pads, I couldn’t play it. That’s when she told me she had a boom box in her hotel room. I asked her if she could go get it for me. When it came time to play the song, I explained to the crowd that it was a “special request” and that since most of them were my age, they probably remembered when they were teens, holding up the telephone to he speakers of the stereo so a friend could hear a song. Then, I help up the boom box and said, “This is going to be a little like that”. I pressed play, held up my mic to the speaker. Everyone cheered and flooded the dance floor. It was definitely an outside the box moment. A lot of people are surprised when they see me opening the door for guests, getting drinks for the head table, even going table to table to let people know I’m taking dance requests. To me, that’s just simply doing what other DJs won’t do, and that’s one reason I stand out from the rest. To me, customer service comes down to making sure you’re satisfied, and then going that one extra step to give you something you might not expect. What’s your favorite part of being a Complete Music DJ? Complete Music is the type of company not afraid to let its DJs make suggestions and find new ways of doing old things. I’ve created and presented new interactive dances and activities that the rest of the staff have latched onto and gotten great feedback about from their clients. Since we have over 40 DJs that work here, we often get the chance to bounce ideas off each other and help one another with potentially difficult scenarios. For our clients, it means that we have a wealth of talent available if you don’t know exactly what you’re looking for. I love a good party! I’m not just a great DJ, but I’m a phenomenal EmCee whose skills are near unmatched in our industry. 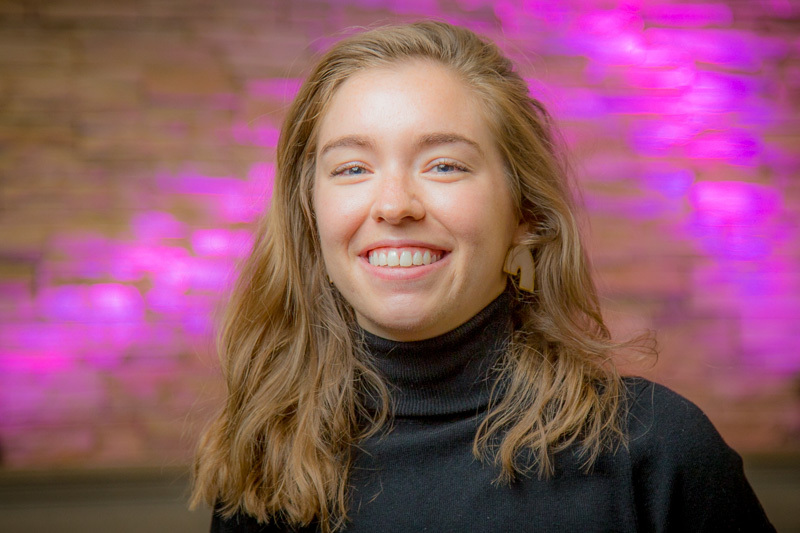 I can host any event with the absolute highest level of professionalism and excellence, and if you need help with organization, I can help you craft your event so that it flows as seamlessly as possible. I’m creative, versatile, and flexible, but I’m never afraid to help you and your guests have as much fun as the law allows, and I will NEVER bulldoze my way through what you want at your event. For my full-time work, I am a musician, actor, comedian, video and audio editor, and I’ve worked in professional improv comedy in the past. I am also a songwriter with about about 100 songs to my credit and my main aspiration in life is to be a professional musician full-time. The DJ was very personable and played the music we requested. I felt like he really cared about what we wanted and the attention was focused on our personality. Zach got the attention of the crowd so everyone would have a good time. Our DJ, Zach, clearly cared about making our day exactly how we wanted it. He controlled the flow of the party, always polite, respectful while getting the job done. When he had down time he even got the head table drinks which just shows how he goes above and beyond at just trying to make everyone just enjoy the day and forget about logistics of what we need to do. He was fantastic. I can be laid-back, but also very outgoing. I hate cheesy DJs though so I’m just fun and personable vs obnoxious. My favorite memory would have to be DOMINATING a whole wedding party in a dance-off. They never saw it coming. I love every type of music, and I love watching a crowd go crazy over a song they haven’t heard in a long time. That is always a satisfying feeling that never gets old. I have a very musical brain, which was raised in every type of music thanks to my parents. So I’d like to think of myself as incredibly well-rounded. My favorite part of the night is introducing the wedding party and watching them do they’re dances in front of everyone. I also always love to hear the toasts. Zack was an amazing DJ and he helped make our night perfect. HE was attentive and excited to be there. I have many friends getting married soon and will highly recommend Complete and Zack. How would you describe your “DJ Personality””? everything runs as smoothly as possible according to our schedule. to make sure everyone has a great time! entrance. One where all of the couples came in to different songs. comes to talking with people throughout the night, I’m all about it. can just sit back relax and hangout or party! love with it over the course of my time here! -I love photography as much as I do music! Jordan was amazing! The atmosphere was perfect the entire night. He orchestrated our grand entrance flawlessly and got the crowd excited to receive us. He helped dismiss tables for dinner and frequently checked on the head table to see if we needed anything. Our dance floor was lively all night long and we had an amazing time. He even made time to go around the room and take requests (which was impressive because we gave him a very long list of "must plays"). Some of our requests were uncommon (like several Sonic and Super Mario video game remixes) and we thought we would need to send him a bunch of MP3s, but he did his homework beforehand and found every single song we requested. He was a great emcee and kept everything running perfectly on time. We could not have asked for a better DJ for our wedding reception. Thank you Jordan! The deejay services have been very professional and well done. We enjoy having them help enhance our pool parties and making them more fun for our members. John is as smooth as they come. He’ll make sure all your details are followed and will make sure your dance floor stays packed! Our dj was awesome. He listened to exactly what we wanted and delivered! John groves nailed it! He asked specific questions and was nice and friendly. He checked on me through out the night and informed me on timing so we knew when was what. It was a perfect night thanks to him. He interacted with the crowd and even got out on the dance floor. We cannot thank him enough for everything and making our day special! Definitely recommend him!!!!! John the DJ was so amazing! Not only did I think the wedding flowed flawlessly because of his efforts, but I recieved multiple compliments from guests about how good the DJ was! He is truly a master of his trade. I would recommend him through and through. 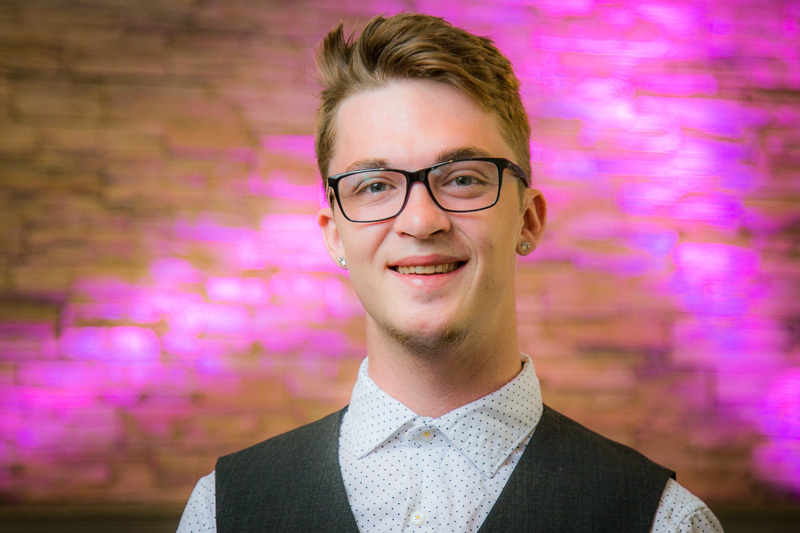 Aaron brings a fresh and hip vibe to your special event! He is popular at weddings, mitzvahs and school functions. I would describe my DJ personality as laid back but fun. The funniest thing I can remember happening at a reception was a groomsman hitting a split and ripping his pants at Andre’s in South County. It was a hilarious moment and he just kept dancing like it never happened! Honestly, anytime the guests are worn out at the end from having so much fun is a favorite memory! My favorite thing about being a DJ is meeting all the different people you interact with and bringing someones vision to life. I just love what I do and I hope it shows in my work. My favorite part of the night is when the dance floor is opened up. I like using a party starter like the Snowball Dance because the dance floor goes from almost empty to packed in three minutes! I really like Poison by Bell Biv Devoe! I became a DJ because I like to have fun and this job is both fun and rewarding. List a fun fact most people do not know about you. I’m pretty darn good at Basketball. Aaron was the DJ at our wedding and we were so impressed with him! He met with me before the wedding not just to discuss music, but to understand who Ryan and I were as a couple, what we liked, our story, and how we wanted our day to go. He put a lot of forethought and work into making our day exactly how we wanted it and it definitely showed on our wedding day; He checked in with us from time to time, letting us know what was coming next, but we really didn't have to consult with him much during our wedding day because it was so well planned out ahead of time. He worked well with my other vendors when needed and he got the party started and kept the party going...even when he was almost taken out by the disco ball when a crazy storm blew in! He went above and beyond to make our day perfect and that's exactly what it was! I'm so happy a friend suggested him to us and now we will be referring all of our friends to Aaron with Complete! Thank you so much! We loved our experience with Complete and our DJ, Aaron. The ceremony and reception were flawless, and they catered to all of our requests of song versions and specific timing for first dances and the processionals, etc. Aaron was outgoing and fun, and very professional. We were so happy with our choice to book with Complete and would highly recommend them and Aaron! How would you describe your “DJ Style”? I’d say my DJ style or personality is friendly and outgoing. I’m always there to give a helping hand and very flexible. One of my favorite memories was when I had a bunch of the kids at the party all sing “let it go” and then later lead two different conga lines around the room! My favorite thing as a DJ is at the end of the night seeing the bride and groom run over to me and tell me the night was perfect. I believe my I stand out because of two things: My flexibility and my ability to read the audiences music style early on. My favorite part of the night is the introductions because it’s the first time I get to meet the bride and groom in person and I get to make everyone in the room feel excited! Who doesn’t want a job where they lead a party and make people happy every weekend? I am big movie person and am studying to be a cinematographer. I’m also an avid runner. 5k baby! Adam was great!! On top of things all night and working his hardest to make sure everything went smoothly! The card from him was also a very nice touch! Complete was absolutely wonderful! Adam did a fantastic job! He created a mash up of songs for my dad and I to dance to, and it was perfect! He also continually checked in on me throughout the night to make sure everything was going good. I would highly recommend complete and Adam specifically. I am very outgoing and energetic, I will find a way to connect with all generations. I dance, interact with the crowd and constantly check on you and your guests to ensure that everyone is enjoying a night they will never forget. During a show earlier this year there was a flower girl that was probably 3 or 4 years old who absolutely loved me. I played her favorite song, “Thinking Out Loud,” by Ed Sheeran, and asked her to dance with me, so I picked her up and danced with her. Afterwards the mother of the bride, the girl’s grandmother, came up to me and told me that the girl’s father wasn’t in the picture and I was the first person to ever slow danced with her and that melted my heart. I will never in my life forget that dance, girl or night. I get to ensure that your night is the one that you have dreamed of your entire life. I get to meet amazing people and make a lasting impression on hundreds of people that will be in their minds forever. I naturally connect with all age groups. Kids are naturally drawn to me and the older guests always love talking to me because I can talk about things nobody has talked to them about in a long time. The young adults are my peers and I will always treat each of them like my best friend which makes them naturally comfortable. Any DJ will tell you their favorite part of the night is the dance portion, which is definitely one of my favorite parts, but my absolute favorite part is meeting the bride and groom for the first time. You find the only two people in the room freaking out and you get to walk up to them and tell them you’re going to make everything okay, and then you see the relief wash over their faces. I really enjoy playing “Teach Me How to Dougie,” by Cali Swag District at parties, because it has a good beat that kind of forces people into a dance-off. I have never failed with that song, it’s definitely a go-to with a packed dancefloor. I actually never dreamed of becoming a DJ. I’ve always loved music, but I was a very sports driven guy and was not very tech-savvy. Complete found me, during my freshman year of college, and it has became my greatest passion since then. I find myself constantly trying to learn more and finding ways to personalize each event, they say emceeing becomes a part of your blood and that’s exactly what happened to me, I’m infatuated. I am currently pursuing a law degree to become a family lawyer, that helps children in abuse and divorce cases; because, events in my past have shaped me to strive to make sure every child feels loved and appreciated. Brenton was amazing to work with! He always made sure me the bride and the groom knew what was going on at all times!!!! He even asked if we needed anything every time he saw us! The best DJ service ever! My dance floor was packed for 4 hours straight!!!! Thanks for everything! Brenton was unbelievably amazing!! Our guests enjoyed every minute of him. He is one of the male reasons why our wedding night is so memorable. He truly did everything he possibly could for me and my groom and he was an outstanding part of our day. I will never forget how much fun we had and how big of a party our wedding reception was, and we owe it all to Brenton. I would recommend him any day! 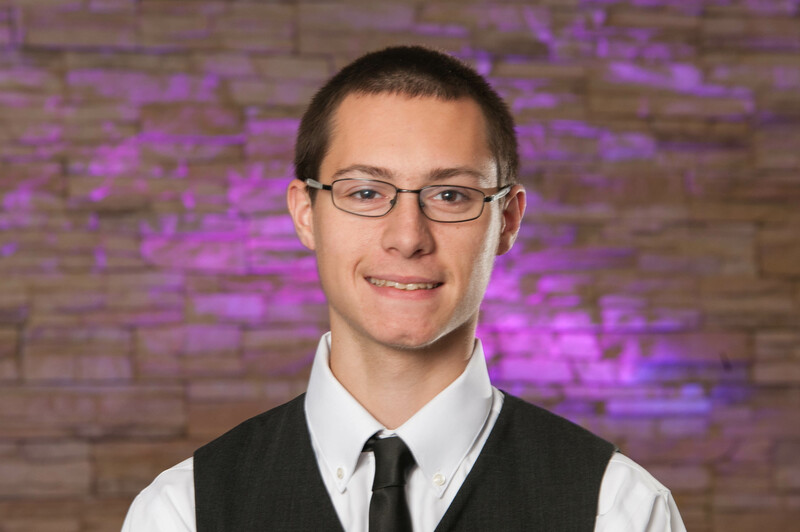 Codey is a talented and fun DJ to have at your special event. He loves mixing music to create a fun and lively atmosphere on the dance floor and his positive attitude is infectious! I’m fun and energetic. I love crowd interaction but can also adapt to fit your preferences. I was working with a multi cultural group. it was amazing how all the cultures came together and shared their music tastes with each other! Controlling the crowds energy and making sure it’s always a fun environment. I am able to mix to any crowd, read crowd reactions well and still have fun interacting with everyone! When the dance floor opens up because from there on out, the night stays alive! I was inspired by old school turn table DJs and wanted to master my craft as a professional event host too! I went to school for audio engineering, music management and production. My experience with Codey from Complete was over the top. I had a Birthday party for my daughter . We had all of her friends and family in age ranging from 3 to 90 there and everyone had a blast! Everyone complimented him on how professional and friendly he was. He had tons of games and interacted with everyone in our group so well. Also, the music was played for all ages and we had no issues with cussing or inappropriate music. All together our experience was AMAZING and if we EVER need a DJ again we will defiantly go with complete! Thank you for making Ava's Birthday A Party To Remember! Our DJ, Codey Adams did a GREAT job DJing our wedding! 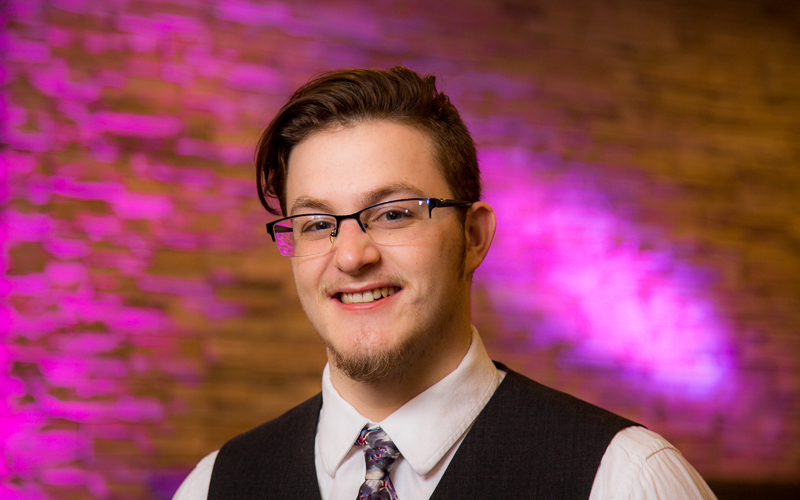 He was extremely professional when meeting with him and absolutely nailed what we were looking for in a wedding reception--we just wanted a party with a full dance floor and Codey kept it packed the whole time! He was easy to contact and wonderful work with. As a company, we chose Complete after looking at a number of other DJs because their prices were competitive and they were extremely professional and well put together. Complete also came highly recommended from some trusted friends. Thank you Codey and the team at Complete for helping to make our wedding day the best day of our lives! I love when the dance floor opens and I start to mix the music live! Because I absolutely love music and people!! Chris was an amazing DJ. My husband and I felt like he was one of our friends! He kept the dance floor full all night long! Our wedding guest loved him as well and had an amazing time dancing. Our Family and Friends New Years Eve party was a huge success. Our DJ Chris Harris was the best! He entertained the kids in the beginning of the night with some super cute games. His enthusiasm and perfect selection of music for all generations made this one of our best New Years to date. You are lucky to have such a wonderful employee! I will definitely be requesting him for future events. Thank you Complete Music and Chris for such an awesome night! Doug will work your reception as if it were his own, with the same attention to detail. 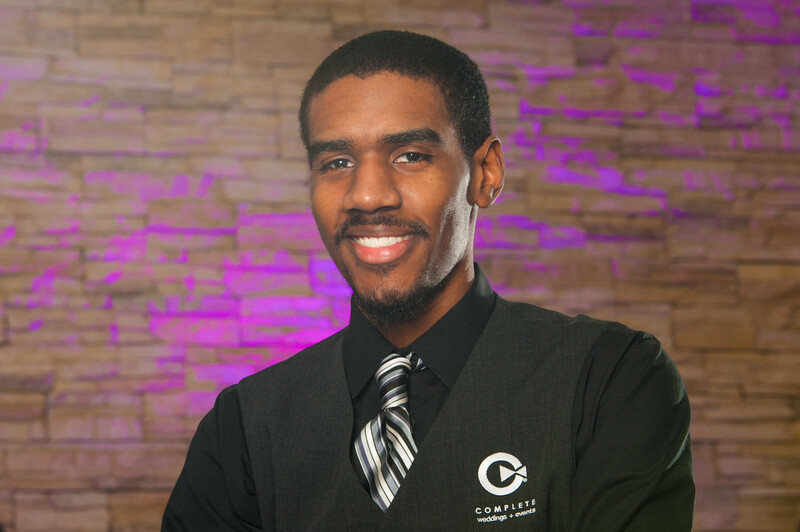 His passion for customer service and his experience running fun and exciting receptions makes him a perfect choice for your big day! My laidback approach and experience take any special moment from ordinary to extraordinary; guaranteed to make any memory the time of your life. This father-son duo took the party to a whole new level, when his miniature right-hand man snuck out onto the dancefloor and they start doing The Worm perfectly in time to “It’s Tricky” by Run DMC. Every Father-Daughter Dance has that moment when his misty eyes twinkle with fond memories, and he’s looking at his precious little girl like she hasn’t aged a day since he first held her in his arms. I have an infectious smile, and that classic radio-show presence of a household name. I bring those same qualities and style to the dancefloor: feel out the energy of the room, inspire an unforgettable evening, and make you feel like the star you’re born to be. Everyone secretly enjoys those moments when you get to take a breath and really feel the rhythm of the night with a slow dance song. My favorite part of the night is what comes next! I put on a classic hit, see everyone’s faces light up with their own special memories of the song they love, and all that energy ignites the dancefloor to keep the party going strong. My core music knowledge is everything: 80s, Rock, Funk, Pop, & Hip-Hop. Absolutely in love with the electronic dance music revival of all those retro rhythms! “If you aren’t having fun, it’s your fault,” is some of the best advice I ever received. If I can make your day, that makes me feel complete. Living in New Mexico, and experiencing Latin-American culture, was where I fell in love with the dancefloor. When you call upon this talent of the turntables, be prepared to “Fiesta Forever” with a DJ like no other! From working with a DJ and Videographer from Complete, I noticed that your people go above and beyond to make the day perfect. Our DJ showed up early to the venue to get to know everyone and spent over an hour on the phone with us to find out what we wanted. It was a great experience and we would highly recommend complete to our friends! Christian brings a fresh energy and personality to your special event. 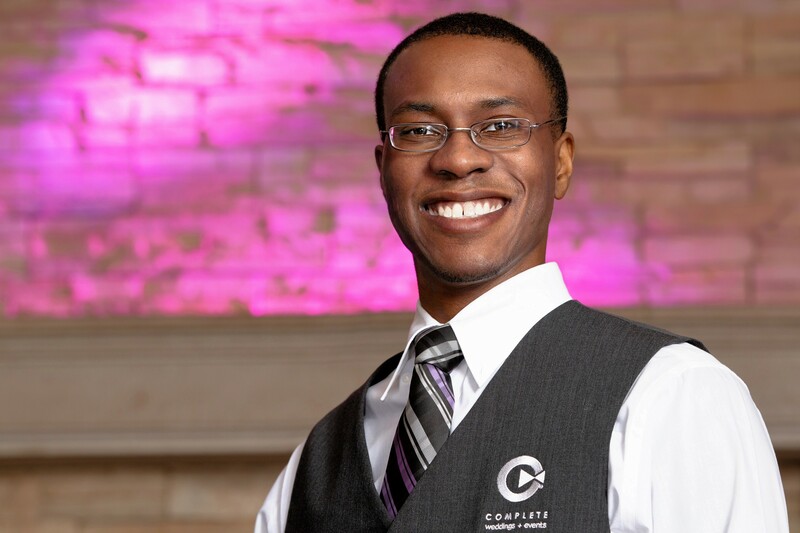 He always has a smile on and will go out of his way to ensure you and your guests are having a great time! I would describe my personality as ‘social’, I love simply talking and conversing with brides and learning their stories! My style is somewhat of a party mentality, once the dance floor opens I keep it packed for the whole night! My favorite DJ memory was at a Wedding Reception where the flower girl didn’t have anyone to dance with for a slow song, so she asked me if I would dance with her! She danced on my shoes and it was the most adorable thing ever! My favorite thing about being a DJ is making these nights memorable. Most people only get this chance once so it’s got to be perfect. I love to see the smiles of all the people at Ceremonies and Receptions and hearing them say they would never forget the day whether it be because of the music or events that had happened! What makes you unique / stand out as a DJ?? I would say what makes me unique is my ability to connect with people. I simply like to talk to others and that extends to this profession. Connection to our clients is my biggest concern, as for my specialties, I’m well versed in creating musical sets that fit the mood and flow well together throughout the night. I’d say my favorite part of the night is the latter half, when there’s about an hour left for the event? It’s more so when the kids and elderly go home and I get to really throw on songs that make people want to get on the dance floor and go crazy! Oh that has to be “Hot in Heere” by Nelly! It’s a classic and a St.Louis tradition! I became a DJ because of two reasons: loving music and caring for people. I like sharing my musical knowledge with people as well as providing any music they might love as well, I’m one of those people who just like to listen to whatever’s on, whether it be Hip – Hop, Country or Rock! As well as making these nights unforgettable, as previously mentioned I really do enjoy this for the fact that it makes these nights incredibly special. I’m glad I just have the opportunity to even participate in these events and making them perfect! of singing and dancing! I love to sing and dance and will sometimes get out on the dance floor with people to participate in the party! We had Christian as our DJ for our wedding and the way he carries himself and his service is amazing. He's so fun, easy going, helpful, and made our night special. When we had some last minute changes to the night's schedule just moments before they happened he accommodated for them and though our crowd wasn't really the dancing type he still made it feel like a celebration. I would recommend him and Complete's services to anyone. Thank you Christian!!! Very outgoing and energetic. Love to have a good time. I had a guy from one of my wedding parties take off his shirt and was going wild on the dance floor, it was hilarious! Just being able to make people smile and dance and have a good time brings a lot of joy to me. I love to get out on the dance floor when its really popping and make a dance circle to show off everyones (including myself) dance moves. The introduction because it is so up beat and I love to see everybody’s crazy entrances they come up with. I’m a big Shawn Mendes fan so There’s Nothing Holding Me Back is probably one of my favorite part songs. Music is one of my biggest passions in my life and I love to party so DJ’ing was a perfect fit. I love to sing and have been doing it since I could talk! Everything was absolutely perfect and a huge part of that was because of the DJ. He was energetic and fun and made sure everyone was up dancing all night and having a great time! Jacob has a passion for people and music and this job allows him to create great events, work with great people and fill the dance floor with great music. It’s a match! I would describe my DJ personality as snazzy. I love to look saucy and bring pizzazz to the event. My favorite DJ memory is providing the music for a ceremony where David Harbour, the sheriff from Stranger Things on Netflix officiated the ceremony in costume. That was pretty cool. My favorite thing about being a DJ is the thrill of giving people a great time. It’s the little things. What makes me unique? Everything from my attire to my dance moves. The climax of the party; when everyone is on the dance floor, great music is bumping, and people have their hands up…singing the song word for word. It’s a moment of pure ecstasy. Ranges drastically from Bad and Boujee to Friends In Low Places. Member of Phi Beta Sigma Fraternity Incorporated. Jacob was awesome! We wanted a very family friendly atmosphere and he delivered. We wanted music that was respectful and appropriate. I absolutely recommend Jacob and this company to everyone! Jacob was amazing! He interacted with everyone! Played everything we wanted to hear! He was efficient and keep things running smoothly! Everyone commented on him! He was loved by everyone! So glad he was chosen to be our DJ! Will definitely recommend him to anyone! Jeff is a high school teacher by trade so he can handle all ages with ease, whether it’s a Mitzvah, Prom or a Wedding! He lives by our Be Awesome philosophy (Be There, Make Their Day, Positive Attitude, Fun!) and and will always listen and provide exactly what you want with enthusiasm and professionalism. He has won a variety of awards for his popularity and customer service here at Complete and is a Top 10 DJ. I am very outgoing and very flexible, ready for anything! I will ensure that your day is enjoyable, relaxing,and that everything goes according to your plans. This is YOUR party and I will personalize it to ensure that it is one of a kind. In the summer of 2012, I was speaking with the father-of-the-bride to let him know that his dance with his daughter was coming up in a few minutes. He told me he had no clue what the song was going to be, so I jokingly told him we were going with his favorite song, Baby Got Back. He laughed and said he was up for that. When I introduced him to the dance floor, I announced that, though the bride had a special song picked out, her father also picked one that was near and dear to his heart. When he stepped on the floor, as I hit the music, he began singing the lyrics to Baby Got Back, we were on the same page. They danced for about 5-10 seconds before I switched it to the real song. The smiles never left their faces for the rest of the night. My favorite thing is getting a hug or a thank you at the end of the night from someone knowing that I made their special event positively memorable is the best feeling. I get to do it every weekend and it never gets old. My proudest achievement was being named Rookie of the Year, and Mentor of the Year in my first two consecutive years as a DJ for Complete Music. My specialty is the ability to personalize my style to conform to the party. I have a lot of energy and I can read the crowd and know right where it belongs. 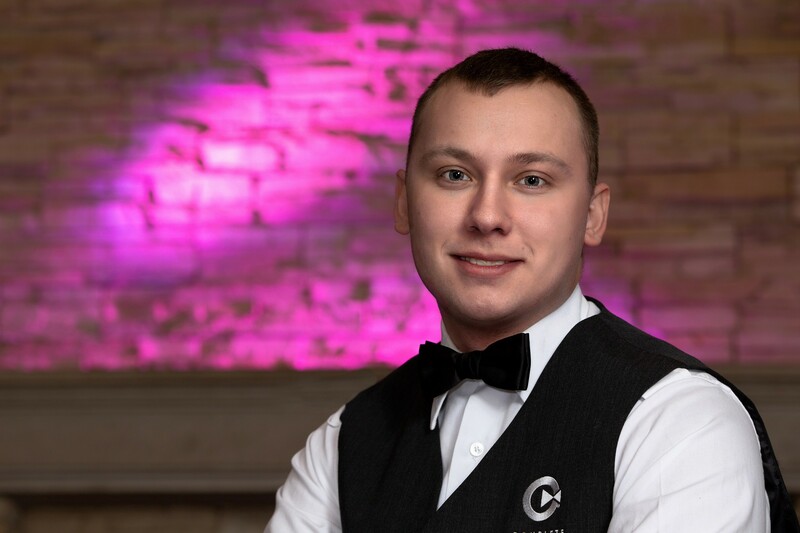 Whether it be helping the banquet staff if they’re short-handed to keep things moving, keeping guests and children entertained, or assisting with a messy cake-cutting ceremony clean up, I am ALWAYS ready to do what it takes to make your day! The beginning, because I know that I am about to make someone’s dream event become a reality over the next few hours and I am up for the challenge! Anything by Michael Jackson. It is always fun to turn his fast stuff into a dance contest and see what moves grandpa has been holding back the last 30 years (or which person is going to pull out the shopping cart or rolling the dice dance moves)! The professional nature of Complete Music, mixed with the excitement and fun of celebrating with someone every weekend. List one fun fact about you most people do not know: I used to be in a boy band in high school, based off of the MTV spoof-boy band, 2Gether and we ROCKED! I also like wolves and my favorite color is blue. Music is such an integral part of a wedding celebration. From the music played while walking down the aisle, the charge of the fathers and the pronouncement of husband and wife by the Pastor - sound, music, timing and audibility are essential. Jeff from Complete epitomized professionalism. He arrived early and worked seamlessly behind the scenes. He made the evening look effortless. The wedding was reverent and appropriately sacred for a wedding ceremony. He then effortlessly transitioned into a equally stupendous role as the MC of the night. He guided us through the evenings events and kept the dance floor packed the entire night. Jeff was attentive to our wishes and offered feedback and advise. His presents was never obtrusive or overpowering and he blended easily into our group of family and friends. He was enthusiastic the entire evening and seemed to be enjoying himself as much as our guests. Jeff helped facilitate and direct line dancing to include the varying ages of the group. Several guests have commented on what a wonderful job Jeff did at our wedding. I would highly recommend Complete and Jeff for you next wedding. Very personable and friendly staff on all ends. I worked with Libbi and Nathan in the office and was impressed by their level of knowledge amd customer service. Jeff was our DJ, he helped us stay on schedule, he had 11 years of experience which was evident in his charisma behind the booth, and his professionalism. Jeff even led us through the moves for cupid shuffle and wobble baby! I can't recommend the complete wedding dj services enough! I’ve come from corporate event background but am also trained with weddings and receptions. This keeps me organized for you and the wedding/ chartering staff to stay timely so we we have ample dance time. That being said I’ve also been playing music/ touring with bands since I was 15, so I know music and many genres. I try to make sure to read the age of the crowd to make sure everyone stays dancing, but you know I will make sure we get down as the older guests leave at the end of the night ;). Best part of DJing is being able to play music, but music that will make people. I’m proudest at the end of the night when I get to talk to you guys, your guests, the wedding party and be told you rocked it. It’s a job that’s all catered to you, and I get to provide the party you want! I was once a lead singer in the band. I’m used to making people enjoy the show. Showmanship is very important as a DJ. But in honesty, this music and the atmosphere the DJ provides is what I believe is the most important aspect to making your event memorable. The beginning of the night will always be hectic. But I will kept you organized and make sure we give you ample time to really party (depending on what type of party you want) but of course after we run through the main events and we start the dance party, that’s when we really let loose and have a great time. I became a DJ just the reason I was a lead singer. I like being on a mic, I like working a crowed. I like to keep everyone dancing. But in all honesty, before Complete, I came from corporate audio visual background. I know how to fix equipment, build equipment, and trouble shoot. You will never have any technical problems when you pick me. All will be groovy! I work with the mentally disabled as a music therapist for my day job. I love it, I love seeing break throughs as small as they are with some of the most genuine people I’ve ever met. It takes a certain personality type and an extreme amount of patience, but one you have that break through, your whole day, week, month, year can be made. The price was extremely reasonable for the quality of entertainment. Our DJ, Evan, was professional yet personable, and he kept the party going until the place shut down! He did a fantastic job of reading the crowd and catering to our musical tastes. Evan interacted with the guests in a way that was fun but not cheesy. I can't say enough good things about our experience with Complete! Such friendly and caring staff!! They made us feel like family and they knew exactly what we wanted. Our wedding guests kept raving about them all evening! They truly made it a magical evening! Omar was awesome - knows how to read a room and has great energy. Hope to work with him in the future and I will be recommending him to everyone I know! From big days to school dances, bat mitzvahs to corporate gatherings, our Complete Weddings + Events St. Louis DJs work with you to create the perfect event, with professional party motivation and expertly coordinated announcements.